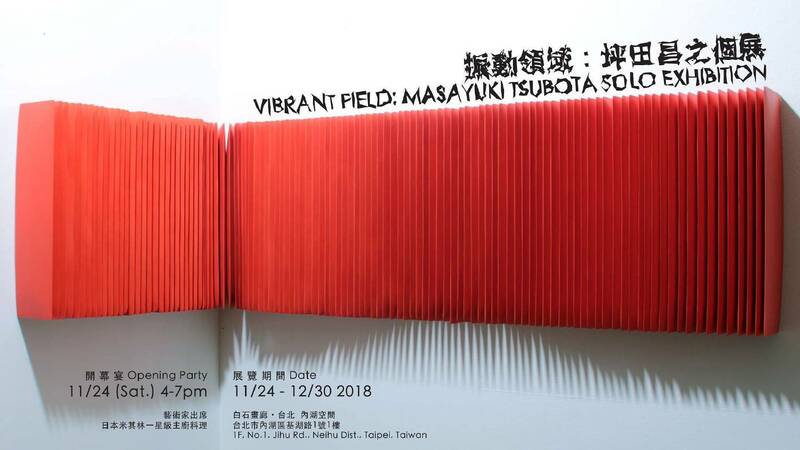 Whitestone Gallery Taipei (Neifu) is pleased to present The Vibrant Field: Masayuki Tsubota solo exhibition, the first solo show of the artist in Taipei. Born in 1976. Masayuki Tsubota finished his master's degree in Osaka University of arts, majored in sculpture. The color, tactileness, and fragrance of oscillation stand on its tight constructability. Depending on the viewpoint, works of Masayuki Tsubota show various expressions and forms in resonance with solidity and flexibility. As a result, the stylish collusion of meticulous but playful feelings stirs the space. Tsubota utilizes natural materials close to the cultural climate, such as woods, stones and mineral pigments that blur the boundary and erode each other. As if they are about to breathe for a new journey, those materials offer a sympathetic vibration to viewers’ five senses. This feature of Tsubota’s works appeal to forgotten memories and inspirational areas, since a vibration is stated as the origin of communication, extending as a deep understanding beyond time and place. This exhibition focuses on the three series of works: "the layer of self, " the wall of self " and "the core of self" which are dedicated to internal part of the human. The artist hopes that the viewers can feel something through the act of viewing, which slowly get to the inner core of themselves.